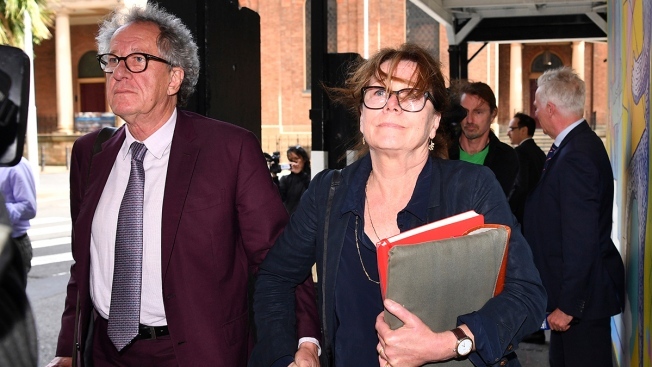 Australian actor Geoffrey Rush, left, and his wife Jane Menelaus leave the Federal Court in Sydney, Wednesday, Oct. 24, 2018. Rush is suing Nationwide News for defamation. The wife of actor Geoffrey Rush cried as she told a Sydney court on Wednesday how he had wept and curled up in the fetal position following newspaper allegations he had behaved inappropriately toward a female co-star. Rush himself also admitted to the court he may have described the co-star, Eryn Jean Norvill, as "yummy," but denied this was accompanied by inappropriate hand gestures. Rush's wife, Jane Menelaus, who's also an actor, wept as she appeared in the witness box at Sydney's Federal Court, where her Oscar-winning husband is suing the publisher of Sydney's Daily Telegraph newspaper and its journalist Jonathon Moran for defamation. The Telegraph's articles last November referred to an allegation that Rush behaved inappropriately toward his co-star — later revealed to be Norvill — during the Sydney Theatre Company's production of King Lear in 2015 and 2016. Menelaus said Rush held her and cried after he saw the first of two Telegraph articles and said, "This has destroyed everything." He became uncharacteristically quiet, was "quite fetal at times on the bed," couldn't sleep and groaned every morning, Menelaus told the court. "For 11 months we've been going round and round in circles, trying to understand why someone would hate us so much," she said on day 3 of the hearing. Rush, 67, denies the allegations against him, and argues the newspaper made him out to be a pervert and a sexual predator. The paper's publisher, Nationwide News, and Moran are pleading a defense of truth and Norvill — who didn't speak with Moran for the articles — has agreed to give evidence. Rush, during cross-examination earlier Wednesday, said he might have told Norvill she looked "yummy" during rehearsals but denied suggestions he'd done this while licking his lips, sticking out his tongue or making groping gestures toward her torso. "Yummy has a spirit to it because we are about to go into — most of our scenes together are going to be very dramatic and harrowing, this is a good start," Rush said in response to questions from defense lawyer Tom Blackburn. He denied suggestions he touched Norvill's lower back under her shirt backstage and deliberately touched or moved his fingers along her breast during a scene in which he carried her. Norvill played Cordelia, the daughter of Rush's titular character, and in that scene he was carrying her body after her death. Rush said he wanted in that moment to "feel the silhouette or the halo of her torso ... that she is no longer alive" but as he caressed down "it wasn't at breast level, it was down torso level." Menelaus said her husband had been "totally bamboozled" about what someone could have said about him when he learned the Telegraph would run their first story about the allegations. She said he was constantly scanning the internet for what people said about him, and worried his adult children believed the articles and didn't love him as much as before. The trial before Judge Michael Wigney is expected to last 13 days.